General Motors Corp. is teaming with Segway Inc., maker of the upright, self-balancing scooters, to build a new type of two-wheeled vehicle designed to move easily through congested urban streets. The machine, which GM says it aims to develop by 2012, would run on batteries and use wireless technology to avoid traffic backups and navigate cities. The Project P.U.M.A. 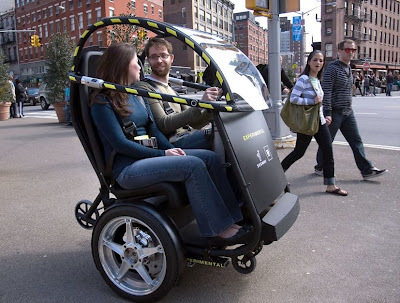 (Personal Urban Mobility and Accessibility) prototype is shown in Brooklyn April 4. GM and Segway say the vehicle could allow people to travel around cities more quickly, safely, quietly and cleanly, and at a lower total cost. ...The Segway Personal Transporter was launched with considerable hype eight years ago but practical issues prevented the scooter from becoming a mass-market product, including its relatively high cost and restrictions on its use in many jurisdictions. GM is betting PUMA's more car-like traits -- an enclosed compartment and top speed of 35 miles per hour -- will lead to better results. GM didn't say how much the machines would cost, but research chief Larry Burns said owners would spend one-third to one-fourth of the cost of a traditional vehicle. PUMA would have a range of about 35 miles. GM said it aims to use so-called vehicle-to-vehicle technology to avoid traffic problems and potentially have it navigate itself through city streets. For a vehicle that will cost 1/3 the price of a new car, I don't see much improvement over a Vespa type scooter, which can be purchased for 3 grand. The plexiglass encosure is nice, but you still must find a place to park it, and will still feel endangered travelling amongst SUVs and trucks in mixed traffic. I'm not opposed to trying new devices like this, but really we already know what works in cities, and it is walking and public transport. I think Segway-tipping is about to become the new cow-tipping. 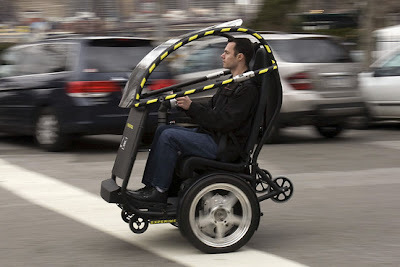 The gyroscope is neat, but it is ultimately just a gizmo that doesn't really help much in the transportation business. OTR History by 7/79 Ltd.